I have decided to put up a new consolidated page of how my trend following / technical analysis system works. This will be part of the new foundation for all up Quant Analytic members. Full access to all of 8 tutorials are available for my Analytics and Elite Course members to explain how to interpret these various charts. 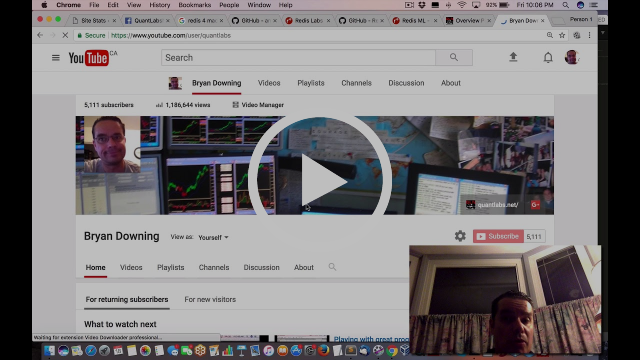 Details of each video is below which can be found in my Analytic Video Tutorial section. If you are a member, just login in here. If you are not a member, do respond to this email to set up details on how to get acesss, I will also mention this is not free since it is a monthly cost. I am preparing new videos and marketing material to introduce the new services. Note that in coming weeks, expect new marketing and ajustments to the website to reflect these feature additions. I will also be detailing on the upcoming courseware which appears to be for Saturdays. Thanks to all who participated in my survey I posted yesterday. This is just a sampling of a real world assessment of the nearly 100 instruments including forex, stock, and commodity. This include Bitcoin as well. Note that these are CFDs which are most people except living in the USA. Also remember that the market data is from Dukascopy out of Switzerland. This entry was posted in Bitcoin Crypto Currency, Forex, Quant Analytics, Uncategorized and tagged new, system, technical analysis, tutorial, videos on March 16, 2018 by caustic. I would like to introduce you to the trilogy of videos which have helped me through automated orders from a programming language like Python to Java. This gives me the ability to execute automated trades into Dukascopy via a message queue bus courtesy of Redis NoSQL database. What you’ll find below is the link to my videos that will walk you through the process of using the Dukascopy API. 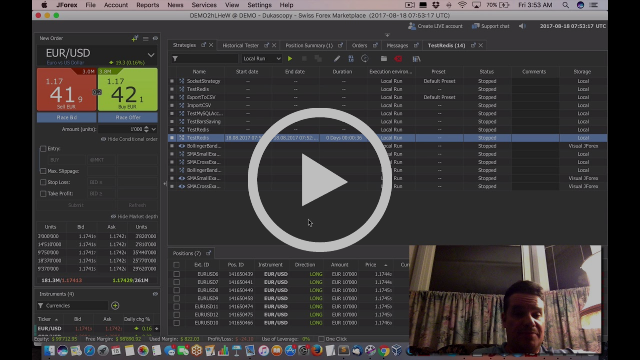 This demonstrates how your trades executed into the Jforex platform. I have decided to extend the half-price sale on my “Python Algo Trading Platform Component Course” until this Monday. With what I have listed above, it enables you now to use your Python scripts to be hooked into this powerful broker. This entry was posted in Forex, Premium Membership and tagged API, automated, Dukascopy, ForEx, Java, Python, trading, videos on September 29, 2017 by caustic. This entry was posted in Premium Membership and tagged Aug 28, bonus, Heads, videos on August 21, 2017 by caustic. This entry was posted in Quant Development and tagged automated, Interactive Brokers, trading, videos on August 16, 2017 by caustic. Here are some of the latest updates I got for doing financial/trading charts for C++ and Python. I want you to know that these are outdated techniques now since they are desktop. The future will be in mobile so I will address that in my next post for Apple IOS. This entry was posted in Quant Development and tagged C++, chart, potential, Python, trading, videos on May 6, 2017 by caustic. Here is a selection of some popular released videos from Quantcon 2016 which is sponsored by Quantopian. Even though they are both a trading platform, trading education and so on, I know they are also hoping to generate alpha as an alternative hedge fund. I have not heard any public recent performance metrics on this alternative fund. 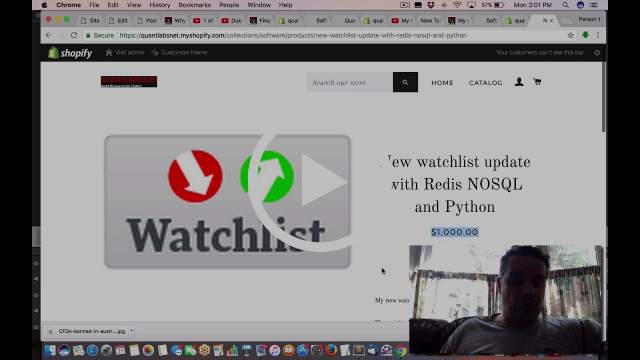 Also, one of the videos I list from the founder will offer 10% of trading profit for your IP algo you provide to their trading strategy arsenal. Good luck with that but Quantcon sounds worthy to attend though. Who’s going this year? This entry was posted in Quant Opinion and tagged 2016, popular, Quantcon, Quantopian, videos on March 13, 2017 by caustic. This is the new Youtube channel playlist for my new upcoming service. It reveals the kind of charting/data that will be available for my members. This entry was posted in Quant Analytics and tagged analytics, Quant, service, tutorial, videos on January 27, 2017 by caustic.